Starting with version 14.04.14, Lazy Nezumi Pro allows you to draw complex shapes and fractals using the Scripting engine's L-System functions. This tutorial will teach you how to use these functions step by step. Reference tables of all functions and instruction symbols can be found at the bottom of this page. A set of symbols called the alphabet. A string of these symbols called axiom that defines the initial state of the system. A set of rules that describe how these symbols should be transformed each time the system is iterated. The system will be iterated a number of times, with symbols being changed according to the rules. This will produce a final string of symbols, which will be read as instructions to move the pen in order to draw a shape. Let's start by looking at a famous L-System: The Koch Curve. How is this used to draw something? We read the final string from left to right. Each time we encounter the F symbol, we draw a straight line. If we encounter a - or + symbol, we turn left or right 90 degrees. The following image shows the results. Then go ahead and click Compile. Since this program has two user variables, two parameter sliders should appear: length and iterations. Click on their "..." buttons to set their range to something more useful than [0-1]. Length (set with the lsysLength function) is the distance the pen travels each time the system encounters a Draw Symbol (in this case F, as set with the lsysDrawSymbols function). A value around 10 should be a good start. Iterations (set with the lsysIterations function) is the number of iterations that should be performed on the system after compiling the program. Be careful with this one: if you have highly recursive rules, setting a high number of iterations will take a long time to compute the final system string (and the application might become unresponsive for a little while). Usually you won't need to go above 10 iterations, so set a range between 0 and 10. All of the L-System functions except lsysAdvance are only used when the program is being compiled. When you are drawing, lsysAdvance steps through the final L-System string until it finds a Draw Symbol, at which point it moves the current pen position and returns. This position is stored in the ox and oy variables. If you open the Scripting Graph window, you can see a preview of the resulting L-System as you change the parameters. Drawing an L-System in your art app may take some time, so it's a good idea to look at the preview first to get a general idea of what you will get. 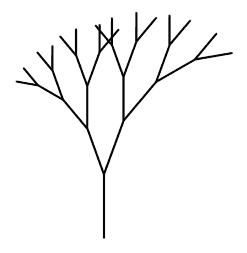 But what if we want the branches to grow at a slower rate than doubling at each iteration? You have two more options: the % symbol which will divide the length by the Length Scale Factor (which is set to 1.3 by default), and the & symbol, which will decrease the length by the Length Increase Factor (which is set to 0.1 by default). You can change these values by calling the lsysLengthScale and lsysLengthInc functions. Here's what it looks like after 6 iterations. This is starting to look a lot better! For this to work correctly, don't forget to bind the pen's pressure to line thickness in your art app's brush settings. This will make two new sliders appear. 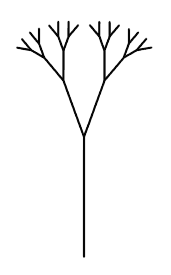 Set the range for angleRandom to [0-45] (since it is an angle), and you can leave the range of lengthRandom to [0-1] (since it's a percentage of the current length). 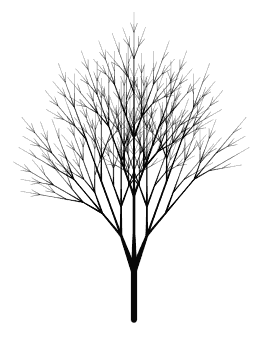 Small values will go a long way to make realistic looking trees. If you set these too high though, you will get some pretty crazy results which might not look like trees at all anymore. Here are some examples of what you can get after 6 iterations, with angleRandom set to around 5, and lengthRandom to 0.15. 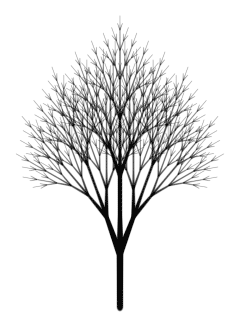 I've also set the Length Scale Factor to 1.6, to simulate leaves at the end of branches. I hope this tutorial has sparked your interest and that you will start exploring L-Systems on your own! If you look under the L-System category in the Scripting Mode, you will find some examples to get you started. Feel free to copy/paste the code into your own Custom mode programs to tweak them and create new patterns! You will also find a wealth of information and examples on the internet by simply doing a Google search. There is no standard way of defining L-System instruction symbols, so you may have to do some minor translations to get them working correctly in Lazy Nezumi Pro. Here is a table of all the available L-System related functions that you can use in a Scripting program. Set the Axiom (starting state) of the system. Set the number of times the system should be iterated before producing the final instruction string. Set the symbols (one after the other, without spaces or commas) that will cause the pen to move when encountered in the final instruction string. Other symbols will only be used to control the evolution of the system as it is iterated. Set the pen's starting Direction vector. Default is (1, 0). Set the starting Angle (in degrees) that will be used when processing a rotate (+ or -) instruction. Default is 90. Set the maximum angle (in degrees) that can be randomly added to the current Angle when processing a rotate instruction. Default is 0. Set the Angle Scale Factor. Default is 1.2. Set the Angle Increase Factor. Default is 5. Set the starting line Thickness, between 0.0 and 1.0. Default is 1.0. Set the percentage of current Thickness that can be randomly added when moving the pen position. Default is 0. Set the Thickness Scale Factor. Default is 2.0. Set the Thickness Increase Factor. Default is 0.1. Set the starting line Length. Default is 1.0. Set the percentage of current Length that can be randomly added when moving the pen position. Default is 0. Set the Length Scale Factor. Default is 1.3. Set the Length Increase Factor. Default is 0.1. If loop is 1, then lsysAdvance will wrap around to the start of the system's instruction string upon reaching the end. Otherwise, the pen position will no longer be updated. Default is 0. Step through the system's instruction string until finding a Draw Symbol, at which point the pen's position is moved by the current Length in the current Direction. The new position is stored in the ox, oy variables, and the current thickness is stored in the op variable. The following table describes the function of each Symbol you can use when defining your L-System Axiom and Rules. Any Draw Symbol Move the pen position by Length amount in the current Direction. Sets the current Skip Number (used with the ? symbol). Random Skip: Draw a random number between 0 and 10. If it is higher than the current Skip Number, then skip the next instruction. Skip the next instruction. You can use this to write statements like 5?A:B, where either A or B will be executed. Open and close an Instruction Group. This lets you skip an entire group of instructions by writing something like 5?(AB):(CD). 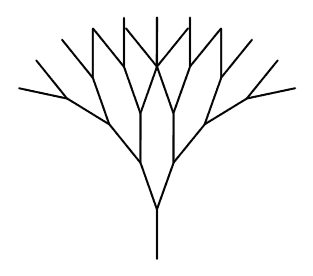 Rotate the current Direction left by the set Angle amount, plus a random amount of which the maximum is set by lsysAngleRandom. Rotate the current Direction right by the set Angle amount, plus a random amount of which the maximum is set by lsysAngleRandom. Reverse direction (rotate 180 degrees). Exchange meaning of + and -. Divide Thickness by Thickness Scale Factor. Multiply Thickness by Thickness Scale Factor. Decrease Thickness by Thickness Increase Factor. Increase Thickness by Thickness Increase Factor. Divide Length by Length Scale Factor. Multiply Length by Length Scale Factor. Decrease Length by Length Increase Factor times Start Length. Increase Length by Length Increase Factor times Start Length. Divide Angle by Angle Scale Factor. Multiply Angle by Angle Scale Factor. Decrease Angle by Angle Increase Factor. Increase Angle by Angle Increase Factor. Save the state and start a new Branch. End the current Branch and restore the state.